A-HOTEL.com - Luxury and cheap accommodation in Höfn, Iceland. Prices and hotel, apartment booking in Höfn and surrounding. This indicative offer was derived from the most recently booked accommodation in Höfn and sort by the price, from cheapest Höfn accommodation to the most expensive hotels. To select accommodation by your preferences we recommend to choose from 40 accommodation offers in Höfn in total. By entering the dates of your overnight stay in Höfn and using the filter tools you can sort the best possible accommodation for you. The entered dates of your stay are crucial for the most accurate offer as it derives all the online information on pricing and availability of Höfn accommodation. Then you can book the selected Höfn lodging (hotels, apartments etc.) immediately. Located at the foot of Vatnajökull National Park, Lilja Guesthouse offers accommodation along Ring Road 1 in Flatey. Höfn is 28. Just 5 minutes’ drive from Höfn in south-east Iceland, this hotel is found along Route 1, close to the country’s largest glacier Vatnajökull. Scenic views and seafood buffets can be enjoyed in the on-site restaurant, which is open during the summer season. Vikingcafe is located in Höfn. Both private parking and free WiFi are accessible on site. Situated in Höfn village just 2 minutes' walk from the harbour, this family-run guest house offers free parking and and brightly decorated rooms with free WiFi access. Höfn Public Swimming Pool is a 5-minute walk away. Set just 1 km from Hornafjördur Airport, this guest house offers guest rooms with a flat-screen TV and free WiFi access. The Route 1 Ring Road is right next to the guest house. Located 4 km off Route 1, this family-run guesthouse is 25 minutes’ drive from Höfn. Set on a sheep farm, it provides simple, fresh rooms, a home-cooked breakfast and a dinner buffet with lamb. Set in Höfn, Höfn Central Apartment features accommodation with a terrace and free WiFi. The property has sea and mountain views. Set in Höfn in the South Iceland region, Hvíta húsið, Kirkjubraut 48 has a garden. This homestay features accommodation with a terrace and free WiFi. 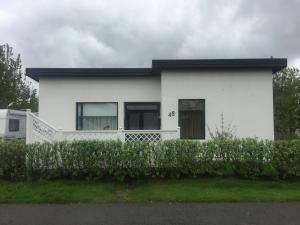 This self-catering apartment is located in central Höfn, a 3-minute walk from Höfn Swimming Pool. It includes free parking, free WiFi access and a well-equipped kitchen. Located by the harbour in Höfn, this property is surrounded by Hornafjördur’s outdoor activity possibilities. Guests can enjoy mountaineering, snowmobile glacier trips and ice climbing in the area. Offering views of Vatnajökull glacier, this former milk factory offers accommodation in Höfn and is just 4 km from the town centre. Free WiFi and private parking is available on site. Located in Höfn, Aurora Cabins features free WiFi and units fitted with a kitchen, terrace and seating area. A microwave and kettle are also offered. Featuring free WiFi, Lónið Apartments offers accommodation in Höfn. Restaurants are within walking distance. Featuring an outdoor hot tub, furnished terrace and modern kitchen, this property is overlooked by the Vatnajökull Glacier. Wi-Fi is free. Situated along Iceland's south-eastern coast, Apartment by the Sea offers self-catering accommodation with a terrace and panoramic sea views. Free WiFi access is available throughout the apartment. Díma Studio Apartments is situated in Höfn. Free WiFi is available. Skýjaborg Apartments is located in central Höfn, a few minutes’ walk from the harbour and Hofnafjördur Fjord. WiFi internet access is available for free. Situated in south-eastern Iceland, in the coastal town of Höfn, this hotel offers local cuisine and modern en-suite rooms with a flat-screen TV. Guests can enjoy free Wi-Fi and free private parking. Located in Höfn, Höfn Guesthouse has rooms with free high-speed WiFi and a flat-screen TV. There is a common dining area where guests can mingle. Boasting panoramic views towards the famous Vatnajökull glacier and the surrounding mountains, Árnanes Country Hotel offers free Wi-Fi. The harbour town of Höfn is only 6 km away.